Visitor attraction Titanic Belfast has unveiled three further galleries, which aim to capture the excitement of the ship's launch day, as well as its maiden voyage. The redevelopment of the three galleries marks one of the venue's most ambitious project since the visitor attraction opened in 2012. Visitors can now experience the excitement of launch day in the gallery, alongside the Maiden Voyage gallery, which transports visitors from four embarkation ports including Belfast, South Hampton, Cherbourg and Queenstown (now known as Cobh) to Titanic’s deck promenade. Guests can not only see and hear the ocean and feel the ship's engines rumbling on board at the Palm Court Café but can also meet Fredrick Dent Ray, a dining room steward and survivor, utilising technology used in Disneyland’s Haunted Mansion and Universal Studios Florida’s Hogwarts Express attraction. The Maiden Voyage gallery also includes an original first class luncheon menu dated April 14, 1912. Tim Husbands, chief executive of Titanic Belfast, said: "In partnership with Titanic Foundation Limited, we are delighted to unveil our new galleries to mark the launch of the Titanic." 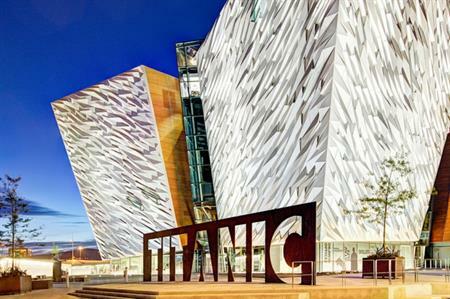 Titanic Belfast can host events for between 50 to 2,000 guests.